Electric vehicle affordability has been a major sticking point for new car shoppers. These cars are routinely priced at twice amount of comparable gasoline-powered models, while offering a limited driving range. Well, Nissan Motors is now doing something about the first problem, having announced today that the its made in America LEAF S model will retail for $28,800. With incentives, this EV will come in at $7,500 or more below that price, putting the LEAFs final price awfully close to a compact Nissan Sentra. The new price is 18 percent or more than $6,000 below the current price. In some states, additional incentives may kick in, effectively lowering consumer cost to below $19,000. Credit Nissans decision to launch production in the United States, as its Tennessee manufacturing plant cranks out the new model. With nearly 50,000 LEAFs on the road globally, we are the leaders in zero emissions vehicles and our class-leading product just got better, said Billy Hayes, Global vice president of LEAF sales for Nissan. From the very outset, Nissan has continuously advanced and refined the affordable zero emissions vehicle ownership experience. Now customers wont have to pay a premium for owning a green car thats really fun to drive, and thats exciting. Range, of course, is an issue that is not resolved as you can go about 75 miles on a charge. That may not be an issue for commuters, but it can loom large for people that need to go from region to region. Taking the other car may be an option for some, but it can be show stopper for one-car households. The current pricing of the 2013 Nissan LEAF is as follows; $28,800 for the LEAF S, $31,820 for the LEAF SV and $34,840 for the LEAF SAV. To date, more than 50,000 LEAF models have been sold worldwide with production now underway in Decherd, Tenn. 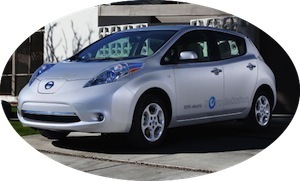 The 2013 Nissan LEAF makes 107 horsepower and outputs 187 foot-pounds of torque. Energy comes by way of a 48-mode lithium-ion battery that is also produced at a plant in Tennessee, this one located in Smyrna. A new battery electric Infiniti model is expected to join the LEAF this year and another Nissan EV is in the works. All LEAF models come well equipped with LEAF S outfitted with automatic climate control, push button start, Bluetooth connectivity, power windows, power door locks, an audio system and a 12-volt outlet. Step up the LEAF SV and your model is equipped with upgraded wheels, an onboard charger, cruise control, a navigation system and an LCD display. Top of the range SL models bring in leather-appointed seats, 17-inch wheels, fog lights, a rear spoiler, automatic headlamps and a universal transceiver. So, why the huge price drop? Nissan credits differences in foreign currency exchange with the savings. Vehicles once imported from Japan cost much more because of the strength of the yen against the dollar. Now that the Nissan LEAF is built stateside, that expense has been removed with Nissan passing its savings on to you, the consumer.